In the wide world of Twitter, you meet many people from all walks of life. The majority of "tweeters" that I follow are pet people such as bloggers, companies, rescues, and many pet parents. All of them have one main thing in common. They love their pets and enjoy sharing information about caring, feeding, new pet products, and great photos. One of these people is Logan Clark. He is a representative from PureZa for Life. I was not familiar with the company, but was curious. When he offered to send me sample treats, I did some research before agreeing. I received them a couple of days later and Bentley’s nose detected the treats before I even opened the envelope. If you haven’t heard of PureZa for Life, let me tell you about them. Their vision: To create opportunities through a unique shared value approach where we strive to diminish the neglect of pets, enhance their quality of life through healthy nutrition, and bring financial opportunities to those who want to make a living while making a difference. All of their products are made with the highest quality ingredients and veterinarian recommended. The gourmet treats are made of fresh, all-natural, healthy products. They are gluten-free, holistic, real food made right here in the U.S.A. PureZa treats never contain artificial ingredients, colors, grains, additives, binders, fillers, or preservatives. There are several different flavors to choose and all are prepared from premium raw freeze-dried meats, fruits, and vegetables. They use a revolutionary freeze-dried process that allows the treats to retain all of their nutrients. Using a proprietary blend of crystalloid trace mineral and electrolytes called Min-Lytes will help boost the overall function of your pet’s system, nourishing their nerves, brain, muscles, bones, and promoting a stronger immune and respiratory system. You can choose from Beef & Carrots, Chicken & Spinach, Duck & Oranges, or a combination pack for your dog. They even offer the Duck & Orange flavor for kitties. Each canister is priced between $18.99 ~ $19.99. Photo courtesy of PureZa for Life. PureZa has a goal to become the largest contributor and supporter in the world for pet rescues and animal service organizations. Each time a purchase is made 10% is set aside to support a much deserving animal organization. You can place your orders here. 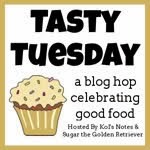 We are joining Kol’s Notes and Sugar the Golden Retriever for Tasty Tuesday’s blog hop. Be sure to hop by their blogs to see what’s cooking! Tuesdays are always special to us because we are able to share some very deserving dogs that are looking for loving homes. We are sharing great adoptable with our friends Dogs ‘N Pawz and Talking Dogs on the Tuesday’s Tails blog hop. These dogs are currently living at PetSavers in Shreveport. If you would love to meet them, please call at (318) 636-0400. Otherwise, please share their information on your social media. that sounds interesting! specially the word "gourmet" hehe. I will share your post and I hope for a furever home for Goober Dawg and Loyal. It sure looks fancy! Not sure if I would like it or not as I am real picky when it comes to stuff with veggies. My sisters eat everything, but I am more cautious. How fun to try these treats. Maybe not good for us but it's always helpful to know for our other family pets (lots of dogs in the extended family!). Thanks for the review. That is so sad about Loyal's story! Hope they both find homes. Oh my...those treats sound delicious. I love freeze-dried treats just like I love my freeze-dried food! And duck and oranges?!? Yum! Never heard of that brand before and they sound good!! Sharing those two sweet pups, too. I have stopped buying supermarket products for my pets since so many of the makers can't guarantee that the ingredients haven't been sourced in "that other country." Made in America doesn't tell me where the ingredients are made. Hmm, I have never heard of PureZa before! I will be looking into their company for sure, thanks for the info! OM NOM NOM. We love treats. Those sound good! And the dogs are beauties. I hope they find forever homes soon! Very helpful post there Melissa. Good one! We had never heard of these treats before... that is SUPER of the company to HELP RESCUE GROUPS... who are ALL struggling to keep up with the NEEDS. I have never heard of this company so I will definitely have to look in to them more! Goober Dawg and Loyal are absolutely precious. We think any company that helps rescue groups deserve a big bravo. Well done to them. Have a terrific Tuesday. Interesting treats. I have never heard of them before, we may need to get some soon. Those treats sound very tasty! We'll be sharing these two handsome pups too! I think the chicken and spinach sound awfully intriguing! Those treats sound yummy! Will share Goober Dawg and Loyal. Love Goober's name! And poor Loyal. My heart breaks for him. Hope they find homes soon! Very interesting idea ... we have never heard of them before but will check them out. I have Pinned both the pups and will tweet them also. They are sweethearts and hope they find forever homes soon! thanks for sharing, never heard of them. Hope all the doggies get a home soon.